Void Troopers is a free game where users play as a captain of a fleet of ships, where their mission is stop the Zurloc alien invasion across the galaxies. 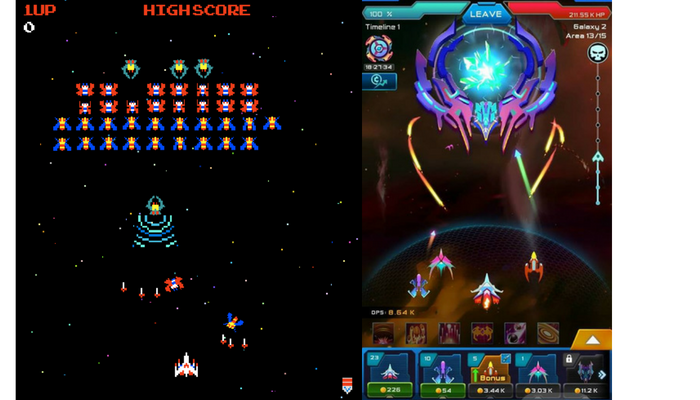 It is very reminiscent of a Galaga or Space Invaders type of game from a visual standpoint, but different in terms of gameplay and mechanics. 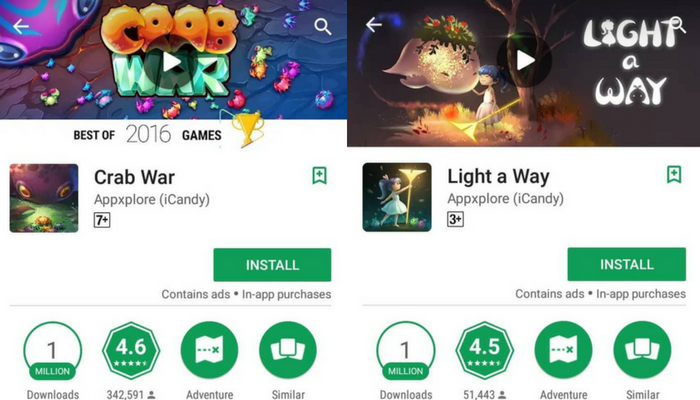 Void Troopers is published by one of Malaysia’s well-known mobile app developer teams, Appxplore (iCandy) who have made games with a combined total of 22 million downloads such as Light A Way and Crab War. If you were born in 1980s and have spent some time in the arcade, you might get a nostalgic feeling along the vibes of Galaga and Space Invaders. Although it’s a similar concept where you control a ship and your mission is to kill alien ships, the gameplay and the storyline is different. 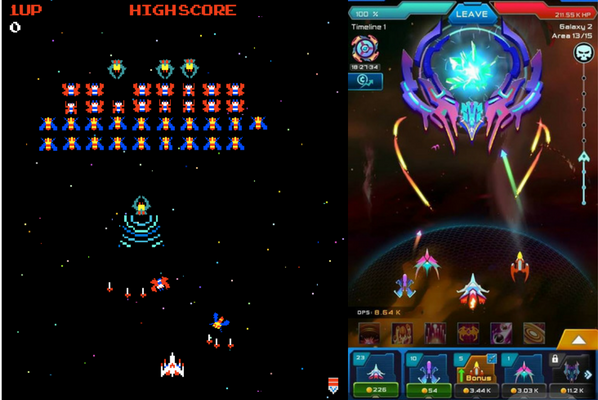 Comparison of Galaga and Void Troopers. The story is based on an alien invasion and as a Void Trooper you’re an elite pilot trained to handle these sorts of threats. It’s your job to go out and stop the invasion. You will travel through Galaxy 1 all the way up to Galaxy 20 for now cleansing the universe of alien scum called Zurlocs. 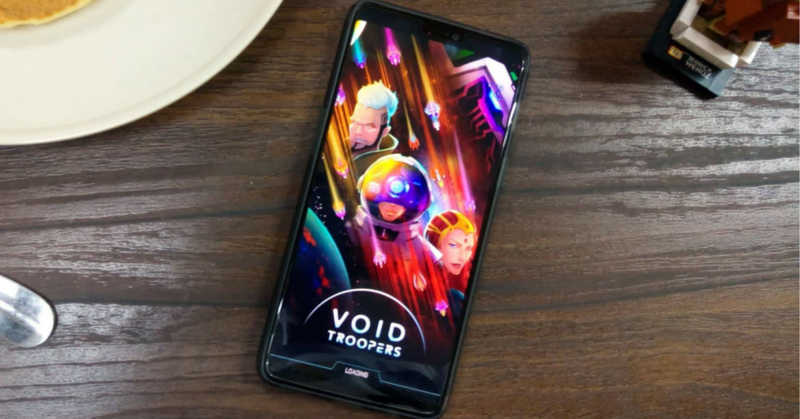 Void Troopers is a game more for the casual users who don’t have more than half an hour to spend on a mobile game. But, if you want, you can take anywhere from 5 minutes or until your thumbs hurt. 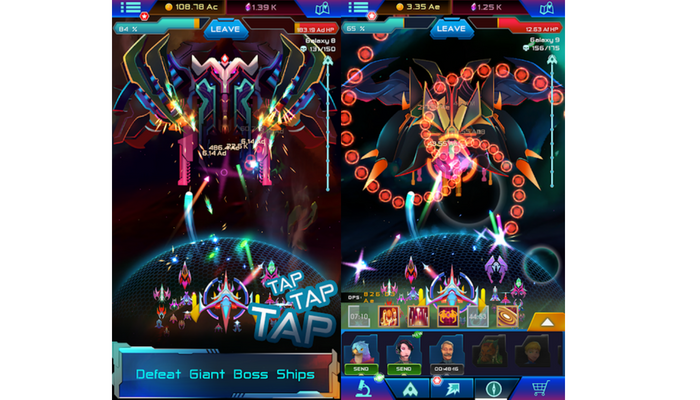 From the screenshot, you can see that enemies will appear at the top of the screen and all you got to do is tap to shoot your weapons. You can tap anywhere on the screen and the faster you tap, the more faster your ships and weapon fires. After every round you will face a boss. The boss is a much more powerful enemy that does more damage and has more health points. If you can’t beat the boss you can always retreat and save up your resources to upgrade your ships and weapons to challenge the boss again. Occasionally, you will see a golden shiny orb floating. 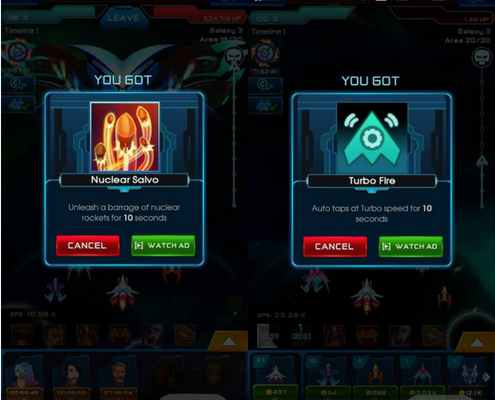 Click on it to get bonuses such as extra gold, crystals (in game currency) or even boosts for your ships which lasts a few seconds (which can be helpful during boss fights). However all these bonuses will come at a cost—advertisements. 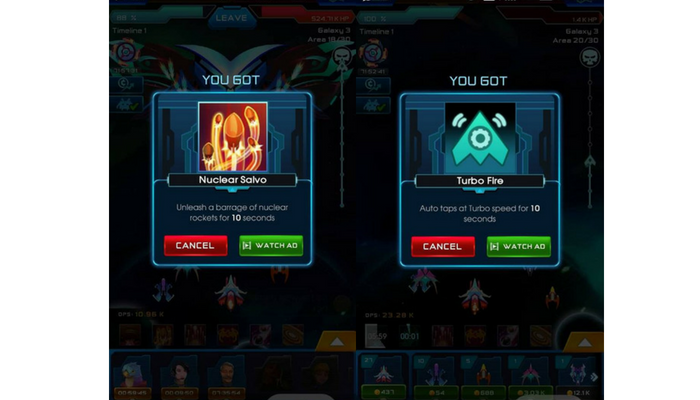 Screenshot of some bonuses when you click on a golden orb. For every bonus that you want to claim, you have to watch a 30-second advert. I guess that’s the price of playing a free-to-play game. However, there is always the option of not watching the ads: you just won’t get the bonuses, simple as that. If you can’t beat the boss and you are tired of tapping, you can leave the game for a few hours. Your fleet keeps “flying” and you come back to more gold which you can use to upgrade your ships and weapons. Do follow the tutorial closely as it really helps. After playing the game for awhile, you will face harder bosses which will take your finger tapping skills to the next level. Thus, the game has a feature called Time Travel where it will give you permanent boosts which can give you an extra hand in beating the bosses. However, as you might have guessed, this doesn’t come without a catch. This time its not advertisements, but it actually resets your whole game back to square one. I spent 5 days getting to Galaxy 5 and it was all reset with just one click. Here is my advice–do not click time travel at the early stages as it is a waste of time. 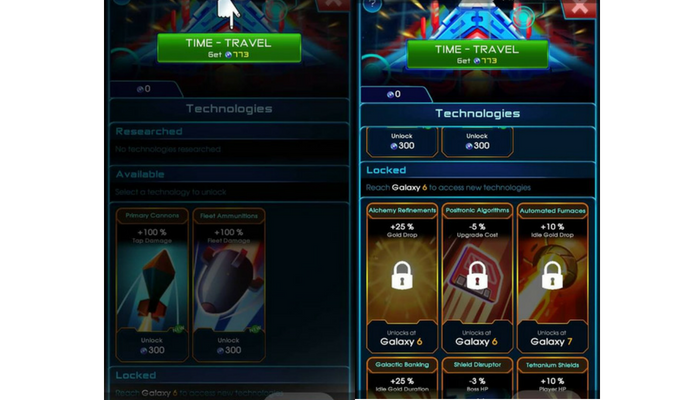 Although the game encourages you to time travel after reaching Galaxy 5, you might want to hold off for a while, because time travel basically means that you go all the way back to Galaxy 1! Although you do get benefits such as permanent extra damage, extra gold and many more bonuses, you need to start from square one again, with no gold, only one ship, no upgrades, nothing! My advice: don’t time travel when they prompt you to. Try to reach Galaxy 10 to 13 first as you will unlock more time travel bonuses. 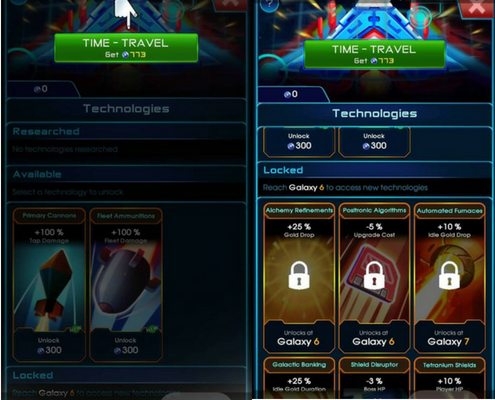 Screenshot of Time Travel Rewards. You can defeat the bosses easily if you just let your idle gold stack up and keep using it to upgrade your ships and weapons. Time Travel will make it easier but for me I personally don’t think the hassle of going through everything again is worth it. It also makes me rather irritated to suddenly lose all my upgrades. What I’ve noticed it that the best time for Time Travel is when you’ve hit a wall (e.g. you can’t defeat a boss despite several rounds of trying and upgrading). That’s probably a good indication that it’s time. 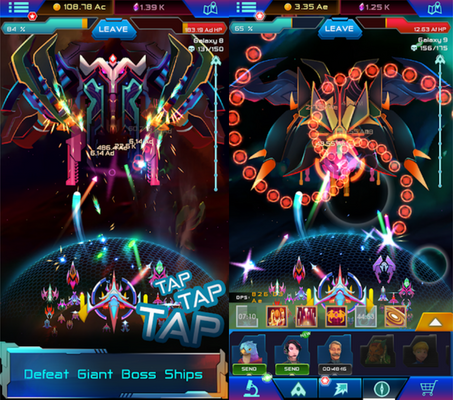 From my experience, if you are a person who plays high-paced games which needs focus such as MOBAs and MMORPGs, you will find it hard to keep coming back to playing tapper games such as Void Troopers. Secondly it also is more of a single player game; there are no multiplayer function or leaderboards, thus it is not about challenging others but more of challenging yourself. I find this unappealing as I like to play games which are multiplayer-based. However, that didn’t stop me from playing until my thumbs hurt from the intensive finger tapping I was doing to advance further. I would give Void Troopers a solid 4.5/5 for its gameplay and mechanics. If you have 5 minutes or so to spare daily and would like an easy game to pick up and put down, I recommend downloading it and giving it a go. Void Troopers is available for download on the Google Play Store and the Apple App Store.